Eventually fret wear out and need to be replaced. This Telecaster not only had worn out frets but it had excessive "upbow" in the neck because the original frets did not fit the slot properly. The frets of your guitar or instrument are actually the playing surface! Having a quality fretjob is essential to the playability of the guitar. A set-up can be the "tune-up" but if the frets aren't right, the guitar will only live up to part of its potential. This page will give you an idea of the work that is involved with making sure the frets are right! In no uncertain terms...fretwork is NOT a DIY project for the uninitiated. I've fixed a lot of damage to instruments that were done by amateurs and even some that were done by other luthiers and it is a real shame to see an instrument damaged because someone only "thought" they knew what they were doing. This is the same Telecaster as the previous picture but now the new frets are in and the fret job is almost done. First I make sure there is enough crown height to justify a fret dress. If the frets are too low the process of dressing them becomes more work than it is worth and an end result that is far from ideal. So, I'll measure them to make sure there's enough to work with. Next I'll look over each fret to make sure it is securely fit into the slot. There's no sense in leveling frets unless they're held firmly in the fret slot, so any loose frets will be glued. 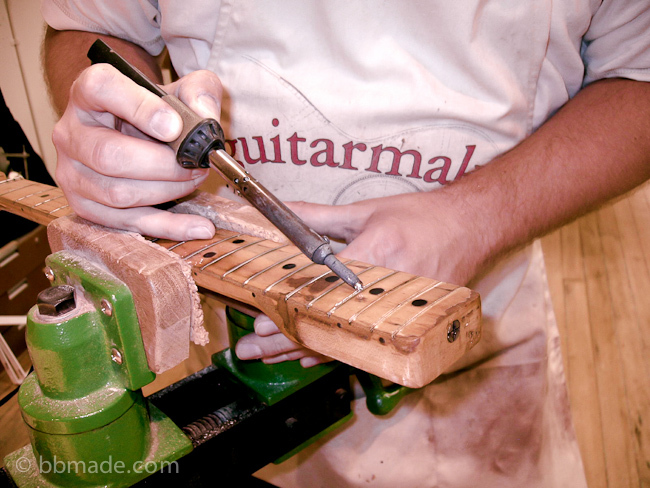 Great care is taken to make sure the instrument is protected while working on it and there are a variety of ways the neck is isolated for optimum control while leveling. The tops of all the frets are leveled taking the absolute minimum of metal off the frets. How much gets removed varies with every guitar. The longer you wait to have them leveled the more wear will have occurred requiring more metal to be removed. Once the frets are perfectly level the crown will be reshaped creating an extremely narrow landing on the very center of the fret crown. The shape of the fret is refined with detailed sanding which removes any marks from the crowning process. The frets are then polished out so they are very smooth and free of any defects. 1929 Gibson L-3 after decades of playing, a decade stored in a shed outside only in a chipboard case. The wear in the fingerboard was something I wanted to save but it...to save it in this particular case meant the playability of the guitar would suffer. Over many years of playing a guitar will at some point need to have the frets replaced. It can be an expensive process but this is never the time to try and save money on a someone quoting you a price that is too good to be true. I have worked on instruments that appeared to need a refret only to be told by the customer they recently had it refretted. In one particular instance I couldn't resist asking them how much they paid for the work and let's just say, they got what the paid for. Excessive ramping in a 1929 Gibson L-3 close up. Careful evaluation of each guitar will determine the unique approach to make it the best it can be. The first thing I like to do is have a conversation with my customer about what, if anything they'd like to change with the guitar. I'll start by considering the fret crown height and width. Many players have never considered these measurements but they know what like in terms of "feel" and I'll answer any questions they have so we can determine what would work best. Perhaps the players wants to match the original wire or maybe they'd like to use a taller wire so there's more metal to dress over the years which adds life to the fretjob. Whatever the situation, it's important to have that conversation so in the end the player gets exactly what they're hoping for. I'll also talk to them about the radius of the board to see if there are any issues we can improve on in the process. As long as all the frets are coming out of the neck it's the perfect time to correct any and all problems. Whenever a guitar needs a refret there's an evaluation of the particular needs for that instrument. How stiff is the neck? What condition is the neck in? How well does the truss rod seem to function? It's important to balance all of the variables to come up with a responsible approach to refretting. As a general rule I always try to take an absolute minimum of wood away in the process. Sometimes that's no problem and other times careful selection of the areas needing attention is necessary to get the guitar back to it's full potential. Many instruments I see that are decades old and in need of a refret have a truss rod that is very, very tight. In that instance I can usually back tension off the truss rod then carefully and selectively remove some wood to get the neck in good working order. There are other options to correct problems and I'll take whatever approach is needed to get the neck back in solid working order. Heating up a fret before carefully removing it. If you have a vintage Fender guitar make sure talk to your luthier about how they will pull the frets. While the customer and I discuss what type of fret crown would be best I need to make sure the wire will fit the slot properly. It isn't something the customer needs to worry about but if there's a mismatch between the fretwire and the fret slots a neck can end up "floppy" or not as stiff afterwards. It's my job to make sure this does not happen. A neck that is a little floppy can be stiffened by balancing the needs/wants of the customer with what is available to fit that particular guitar. It's necessary to pull at least one fret to measure the actual slot to ultimately find the best wire for the job. This is definitely the time to have someone with plenty of experience work on that vintage Fender guitar since the frets went in "sideways" you wouldn't want someone making a rookie mistake and pull them "up" out of the fingerboard. I truly believe that when the work is done the guitar will be as good and often much better than when it was made. How? In a production setting each process must be done in a certain amount of time for the production to be profitable. In recent years more and more companies have begun using the Plek machine which is fantastic. However, I can take the time necessary to do the detailed work that is needed for a fretjob in a way not possible in a factory without a Plek machine. Therefore I believe the end result is as good and often times better than when the guitar was made. Copyright 2014 - All site content is property of the site owner and no part can be used, copied or re-produced in any form without permission.